Like the perfect pair of earrings…knobs and handles are like jewelry for your kitchen! It was truly love at first sight! I wanted to add touches of brass and gold to my new white kitchen…and this knob with mother of pearl set in brass was perfect! Don't be afraid to mix knobs and handles. I knew that I wanted the knobs as accents and that traditional style handles would be more functional...especially on all of the large drawers. Look closely and you will see that I even added a smaller square knob, that matches the handles, to the doors under my farmhouse sink. This layering and use of different styles is what makes your space unique and interesting. Did I already say that I LOVE them?! Love your hardware selections and your genius brackets for your open shelving. I can't get enough of this kitchen. Hi, I hopped over from Pinterest where I saw your acorn chalkboard art. 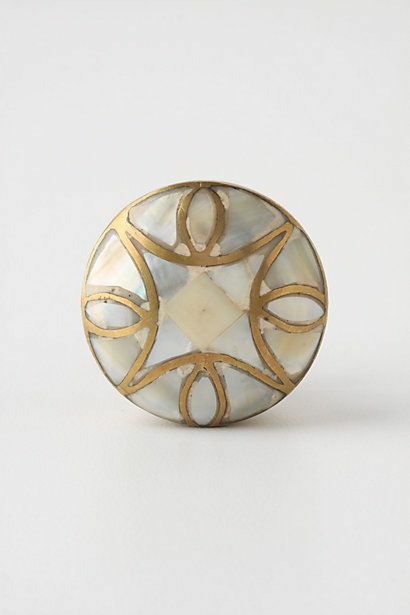 Your kitchen is gorgeous and I love the knobs with the Mother of Pearl! Happy to be a new follower. I love the combination of the hardware. I used the Anthropogie knobs in my bathroom and they are a favorite!! I love the gold touches to your beautiful white kitchen renovation! I built these same reclaimed wood shelves a few weeks ago. @7thhouseblog had posted a tutorial on how to build these shelves awhile back, they made it soo easy to do this project. Love seeing how everyone adds different touches to their idea! Oh it is really cool pics and information to build an elegant looking kitchen space. Your kitchen is stunning! Love those knobs! very beautiful! are the pull handles also from anthropologie? I have the mother of pearl also and have been trying to figure out a good match! Hi. Can you give me the information on the handles? I also purchased the Anthropolgie knobs and am trying to find a good match for my kitchen. I would be so appreciative! Your kitchen is lovely! I really liked all the knobs and handles for kitchen cabinet you shared. These are looking so antique and unique. Thanks for sharing this with us.